Dust Collector #1: GRRR! I hate it when work get's in the way! 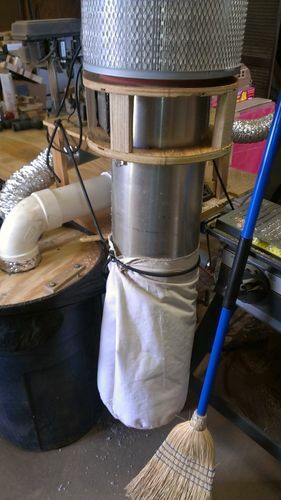 A few months back I bought a 1HP, 13 gallon bag HF dust collector at a very good price, new in box during a sidewalk sale at HF. I think I paid around $60 for it but the wife tells me it was actually only $35. It was an open box, but I couldn’t see where there was anything missing or anything that had even been put together and taken apart. I plugged it in at the store and it seemed to run just fine so I took a chance and bought it. 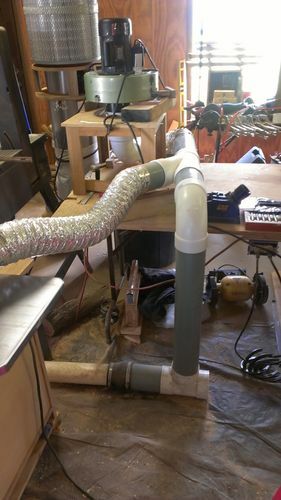 I set it up in the shop, using 4” thin wall pipe and fittings, and some aluminum Flex duct for movable connections, like on the planer so the pickup can go up and down. A couple of weeks ago I decided it wasn’t doing a good enough job as I still had a small amount of chips coming out of the planer and making a mess on the floor. I decided to rebuild it so it would be a lot more efficient and started looking around for a decent design. 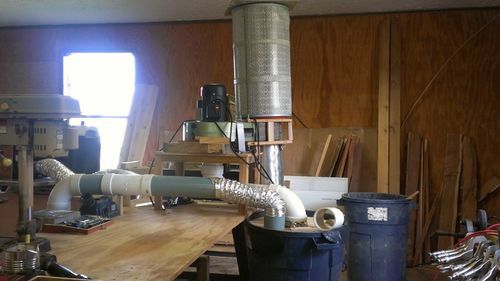 I looked at the dust deputy and the thein, but the more research I did the more I wanted to build something on the order of a miniature Donaldson/Torit Downflo system that sends the dirty air to the outside of the filter and the clean air exhausts through the center. My thinking was that this would provide a lower velocity for the air moving up to the filter and let more chips drop out. I got the system about halfway built, and was starting to put it together, even buying some surplus filters and what is called a pleated bag filter. Output would be air that was scrubbed down to .03 microns, plus I should get higher volume of chips and dust going into the pre-filtration bucket. My boss casually mentioned that we needed some new signs for the pool, new Welcome sign at the entrance to the park, new speed limit signs, the lounge chairs at the pool need to be redone, (with cedar slats), and new site marking numbers and that they needed to be done before oh, no hurry….... March 15th. Crap! I still had a couple of week to go on my new system. I had to come up with something quick, so I came up with this temporary fix. It isn’t pretty, but it does the job nicely. More Piping... notice the open end on the floor as a dust pan. when I turn the system on now it will pick up dirt and chips and dust from 2-3’ away. That is with the planer end still open. 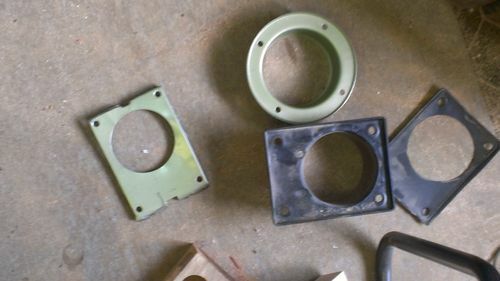 These are parts I cut out of the original blower unit. 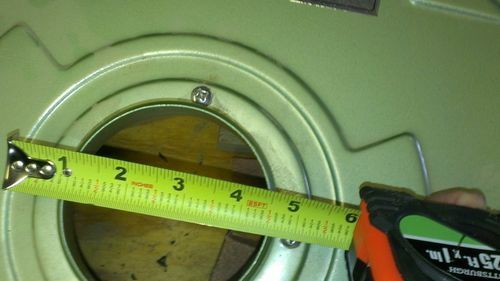 Notice the measurements…... the incoming port was rated at 4”, which it was, nominally, except that it had a turned in lip that brought it down to 3 1/2” which brought volume down to 9.6sq” when it should have been a minimum of 12.5sq”.... a a big loss. 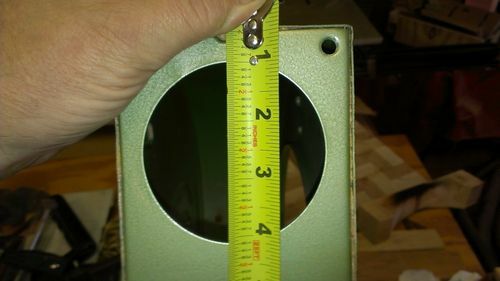 Then on the output (the rectangle with the hole), it was also was suppose to be 4”, (12.5sq” area). it was actually turned out to be 3 1/8” (7.6sq”). this causes the impeller to work harder trying to force the debris through the smaller hole. It’s like putting a damper in a wood stove chimney. I solved the exhaust problem by removing the rectangular piece completely which opened up a 4”x6” (24sq” area) hole. 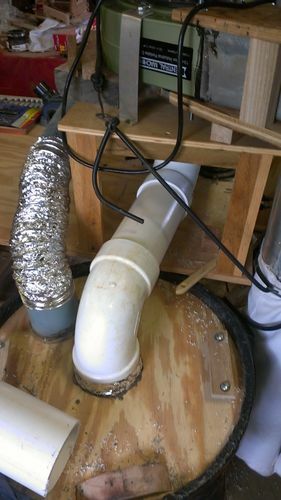 I built a duct to connect it to my downdraft tube and the filter and old bag. 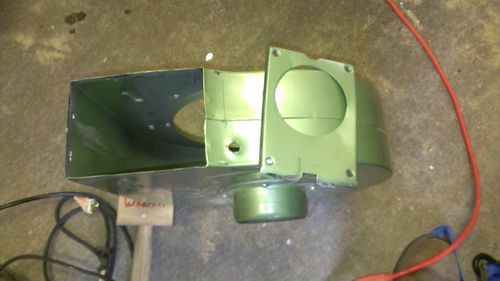 I enlarged the intake by removing the connector and replacing it with a toilet base flange for 4” (12.5sq” area) Sched. 40 PVC pipe. The upside of this change increased the ability of the blower to breath, raised the incoming velocity so it could carry more and heavier debris and slowed down the exhaust so that the debris couldn’t stay in suspension and tended to fall back into the garbage can collector. 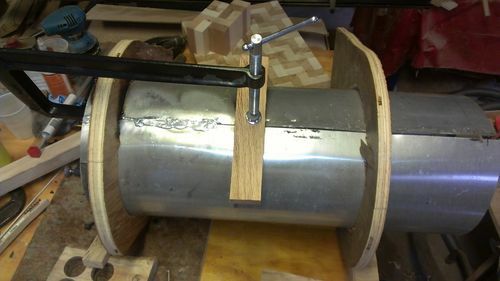 After some testing, I decided I needed to slow the exhaust velocity a bit more, (I was still getting some chips into the bag and the bag was fully inflated), so I took the old rubber maid lid and mounted it like a cone under the exhaust side of the collector can lid which helped immensely. I still get a small amount of chips in the bag, but I doubt I’ll have to empty it more than once every year or two. I am pretty happy with how this turned out, especially since I had to change plans and start from scratch right in the middle of my other build. That build will wait until our spring and summer work is done and we slow down again in the fall and winter. I hope this bit of information will help someone in the future. Ididn’t have time to have our engineers and scientists come with their equipment and do any tests yet… they are on 12 hour shifts and haven’t got much time for extra curricular activities right now. I’ll snag a couple when they happen to get a free day or want me to bring them a picnic table. You have a lot of hidden talents. That redo looks way beyond my abilities but looks like it works well. The modifications aren’t that difficult except that my metal working tools are packed away somewhere and I was never good at it anyway. I’m sure both of you could do something in half the time that looked twice as elegant. I’ve always been one to “Get it done, down and dirty.” Nice looking can come later”. After all, the Yugo wasn’t built in a day! LOL. Just happened to be looking thru the blogs, saw the 9th Infantry badge…I was in the 9th, 2/60th…glad to see the badge..
3/39 for me, We are a lost division even though we have an impressive history.